*Above photo taken by Raf Izdebski #bowen_life. See more of his work on his www.bowenlife.ca. 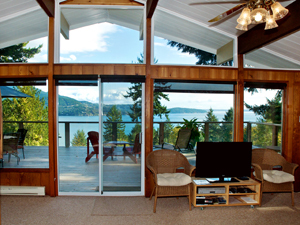 Live Like a Local........Make the Most of Fall & Winter on Bowen Island Fall & winter are one of Bowen’s best-kept secrets. Whether you’re out enjoying a latte in one of our cozy cafes or nestled under a blanket counting raindrops, the autumn-winter wonderland on Bowen is a treat not to be missed. Attend an on-island event. 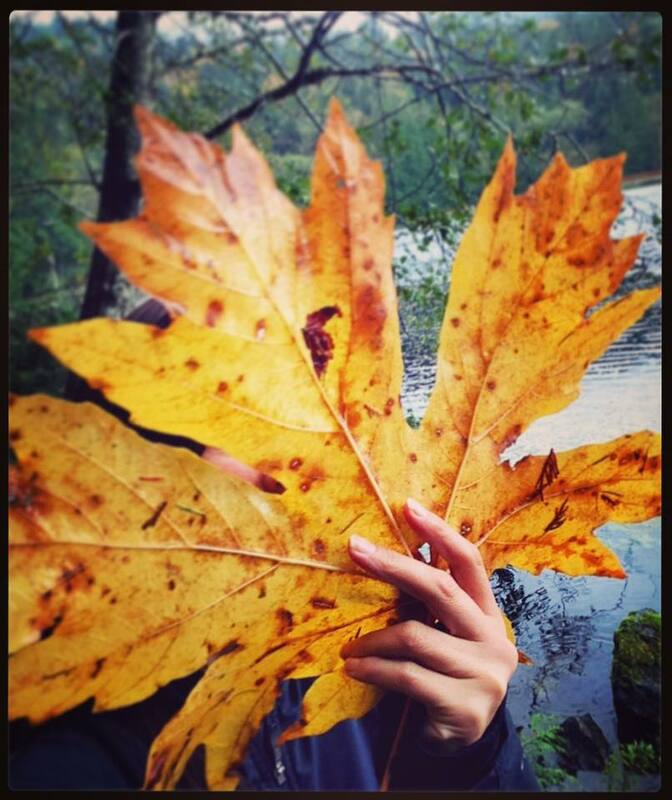 Grab your warm coat and umbrella and discover one of many fall events on Bowen Island. Summer may bring the good weather, but fall and winter is when Bowen Island really comes alive with seasonal community events. Get to know Bowen by being an islander for a day at Apple Fest, a craft fair, a choir concert, or Light Up Bowen. Click Here for Events. 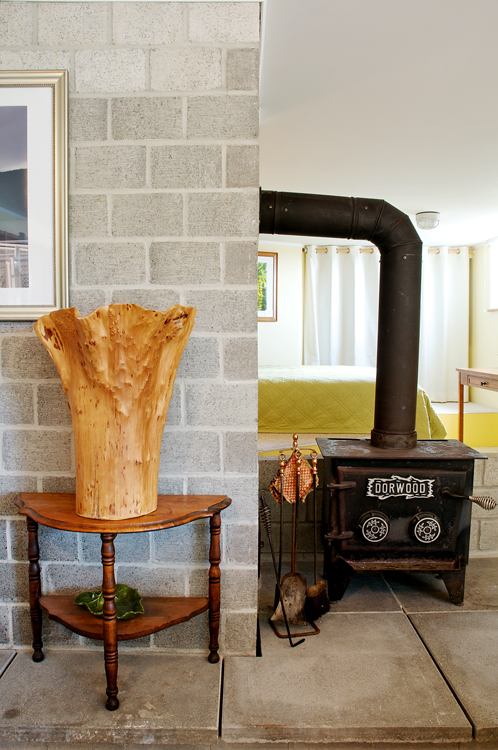 Light a fire in our wood burning fireplace in the Lazy Bowen Hideaway or in the wood stove in the Lazy B Waterfront Suite. It’s not needed to heat the rooms (we have modern conveniences such as baseboard heaters) but it sure adds that “away from it all - put your feet up” ambiance. We allow fires October through April and supply enough wood for your evening fire. Wood is the cost of gold on Bowen so if you would like to burn all day long feel free to bring along additional dry seasoned wood before you arrive. Our General Store and Bowen Building Centre sell Presto Logs, and the Building Centre also sells boxes of kindling. The General store does occasionally sell wood bundles, but give them a call first to see if they are stocked. At the Hideaway & Waterfront Suite, we have packaged wood bundles for sale ($20.00) to top up your nightly allocation, as long as supplies last. We know it is tempting to gather wood from the trails and the beach but you must resist.....it creates dangerous burning conditions. The wetwood smokes and deposits dangerous creosote in the chimney.....Please, no chimney fires at our cottage. FORGET WHAT YOU HAVE LEARNED ~ MAKE IT UPSIDE DOWN!!!! ARE YOU KIDDING? REALLY…….HOW CAN THAT BE? But....we have always put the papaper and kindling under the logs and waited.....and waited.....and waited for the fire to get going. In my case I would finally give up, put the matches away, and sip on my wine. Until....One Day....Anna, my very clever housekeeper , taught me how to make an upside down fire. Today, I am a pro fire builder. I save on my paper, kindling and efforts. Ultimately, I light the fire, sit back down, and enjoy my sustainable .......and glass of wine. We provide limited wood for your evening fires. You are welcome to bring extra seasoned dry wood from the mainland if you would like to burn during the day as well. 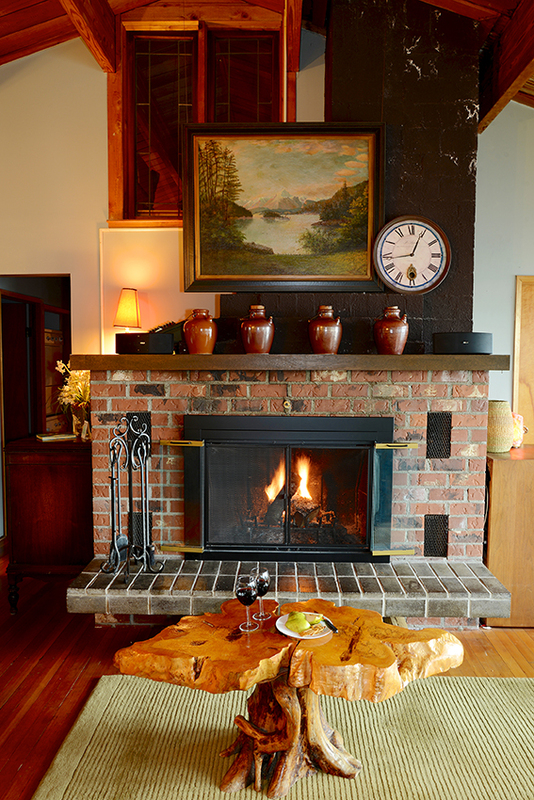 All of our fireplaces provide a romantic ambiance and are in some cases a supplemental heat source. 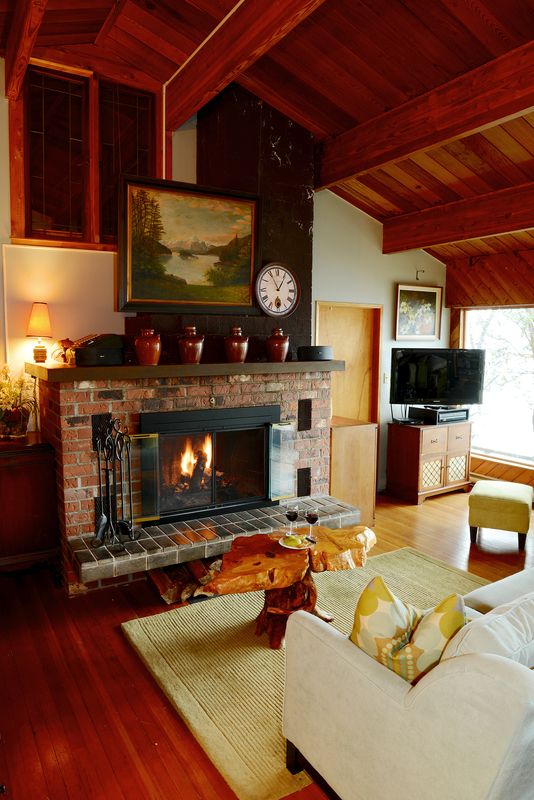 We are modern and all of our properties have electric heat. Our General Store and Bowen Building Centre sell Presto Logs, and the Building Centre also sells boxes of kindling. VERY IMPORTANT ~ Never gather wet green wood from the trail or beach wood as both are not suitable for indoor fires. They will create a smokey burn which deposits creosote in the chimney creating the conditions for a dangerous chimney fire. Watch a movie or 20 on our flat screen TVs...... Both the Lazy Bowen Hideaway and the Lazy B Waterfront Suite are supplied with an abundance of popular DVDs and Classic VHS movies. But hey, if you decide over one hundred movies isn't enough to chose from, take a drive to the library to browse their movie selection. Or.......pop on over to the Knick Knack Nook and see what's for sale......you can splurge and buy a couple for a buck. 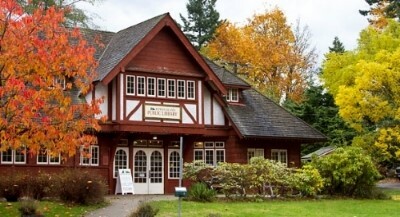 The Bowen Island Library has a great DVD collection, including some of the latest TV series, such as Game of Thrones, Borgen, and Downton Abbey. 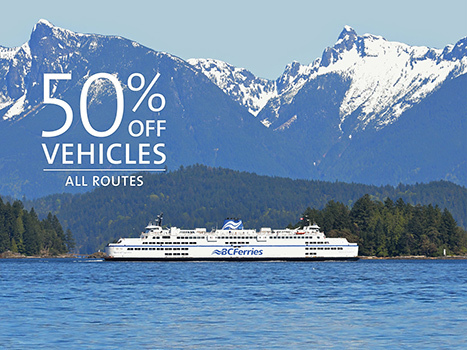 (Acquiring an account is free to Lower Mainland users, and requires a $25.00 deposit for visitors -- you get $20.00 back when you return the card). 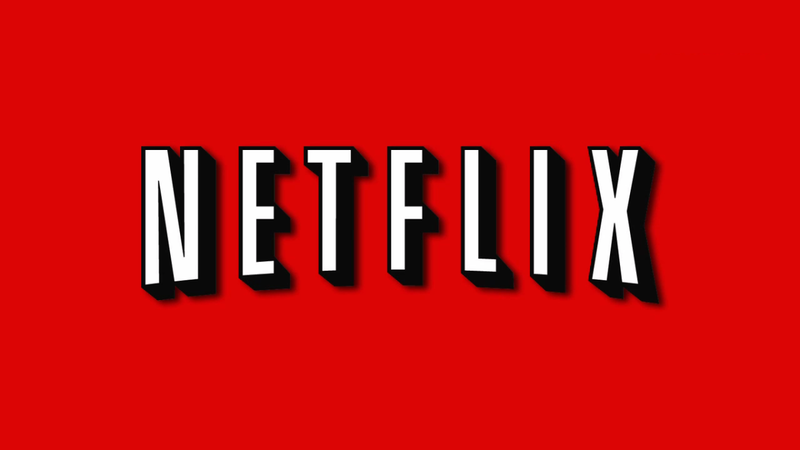 The Lazy Bowen Hideaway 55” smart TV offers Netflix. Your stay is the perfect time to binge watch without having the early work wake up call. 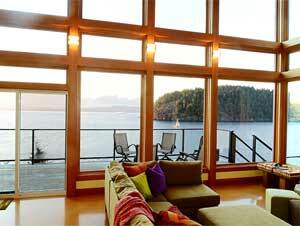 The Lazy B Waterfront Suite has a 42" flat screen TV all ready to watch cable, DVDs or VHS. Bring along your lap top and use our HDMI connection to binge on Netflix...........and the waterfront views are always right there as a companion to your cozy weekend. We provide free WIFI for your own devices as well. 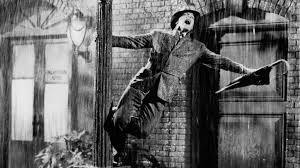 By the way, what is more perfect than watching "Singing in the Rain" when you are warm and cozy inside? 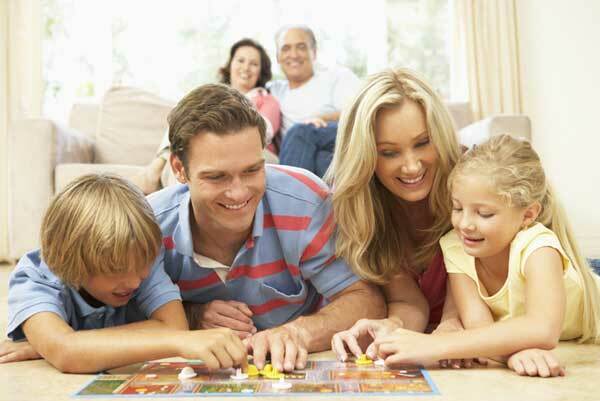 Family board games and puzzles abound------- sit around the table and quietly fit this piece to that piece, corners and straight edges first……….the perfect “think about nothing” activity. Or if you fancy yourself a great speller start up a game of Scrabble. We also have Yahtzee, cribbage, cards, and many other games……. I just can’t remember them all. I don’t know about you but one of my best memories is the family playing a game of Hearts around the dining room table on a stormy rainy night…………Maybe you can have that memory too? 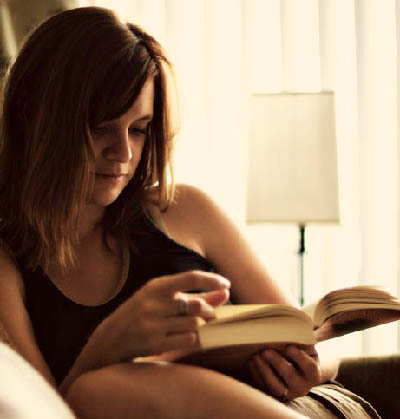 Laze your days away with a good book. We have shelves full of all kinds of books from romance novels to Readers Digest. And if that isn’t enough, you can pick up a book at the Bowen Island Library (see MOVIE TIME for how to borrow). They have used books for sale and you will be kindly supporting the Friends of the Library who fund-raise and support our little library throughout the year. 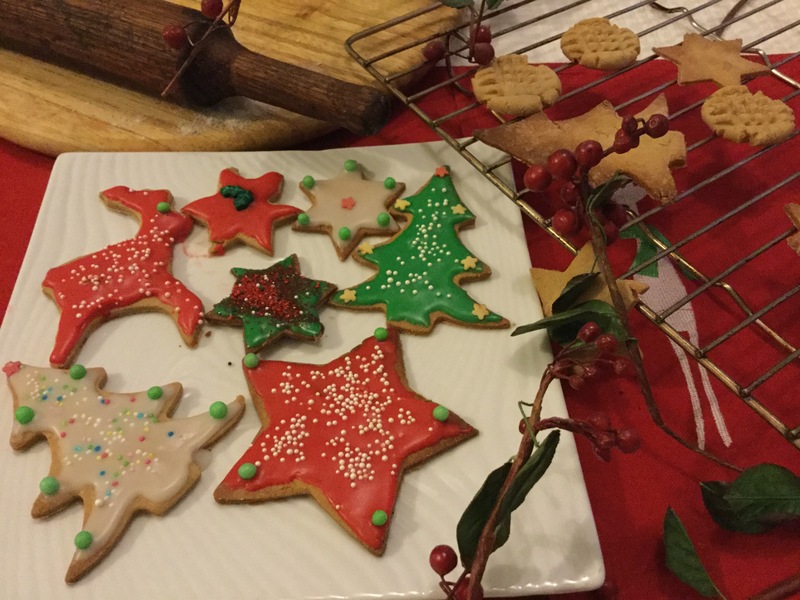 Christmas Cookies made while enjoying the Waterfront views. Start on your Christmas baking...... 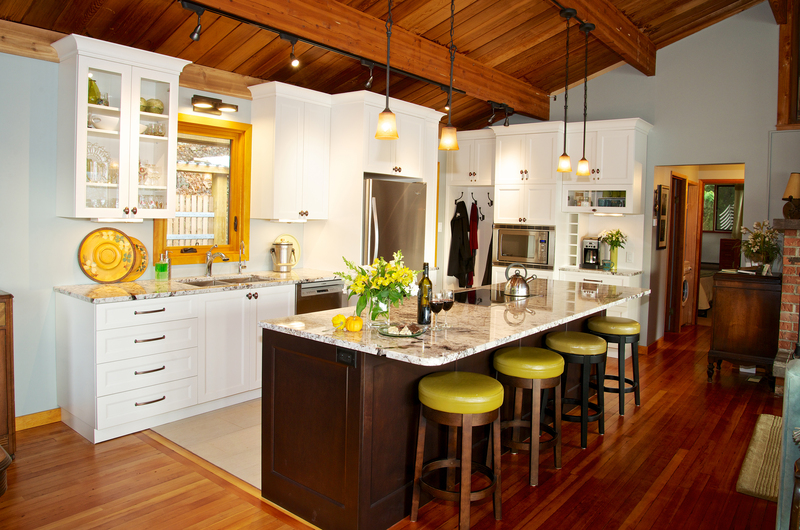 The all-new kitchen in the Lazy Bowen Hideaway is perfect for baking in our new convection ovens. We will supply the cookie sheets and ovens......you bring the rest. The NEW Whirlpool convection oven plus the Micro Convection means you can fill the Hideaway with the sweet scents of cookies and cakes. Pick up groceries from the General Store or the Ruddy Potato Market on your way here. While you are baking up a “storm” you can gaze out the south facing windows watching the ferries and ships sail by, anticipating the next lightning strike. The large 10 x 4 foot granite island allows for a huge mess…..stuff everywhere……..and then………BOOM……….clean up is easy (we have a new dishwasher). Oh and I forgot to mention, the kitchen has many levels of lighting from bright task to ambient mood lighting - you will love it!! Maximize your relaxation with a massage...... We have many wellness providers on Bowen Island, and we recommend booking before you arrive, to make sure you get the appointment time you would like. We recommend Jenni Griffiths, a Registered massage Therapist who is so tuned into your needs that 60 minutes just won’t be long enough… 90 minutes is heaven. Let her know if you want a deep massage or a relaxation massage. Guaranteed she will make you and your body happy. Schedule with Jenni Griffiths of Cedar Room Massage Therapy (604-240-6485). We also recommend Karolina at Spirica Healing (she does mobile massage as well as at her studio), and Solarium Massage Therapy & Rehabilitation. We have you covered.........rain or shine!! 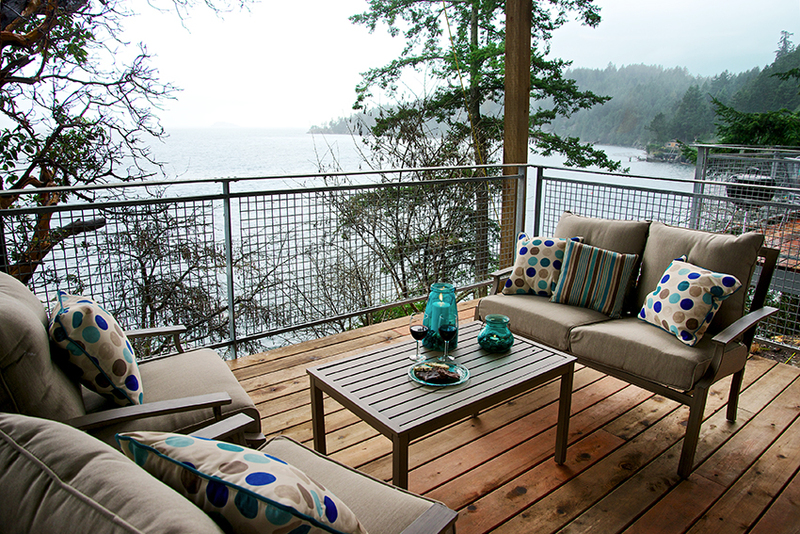 Storm-watch from our NEW Lazy B Waterfront Suite deck… You are covered. We love (and our guests love) our NEW Lazy B Waterfront Suite covered seaside deck with comfortable furnishings. "We came here for a weekend away with our dear friends and it was absolutely perfect. 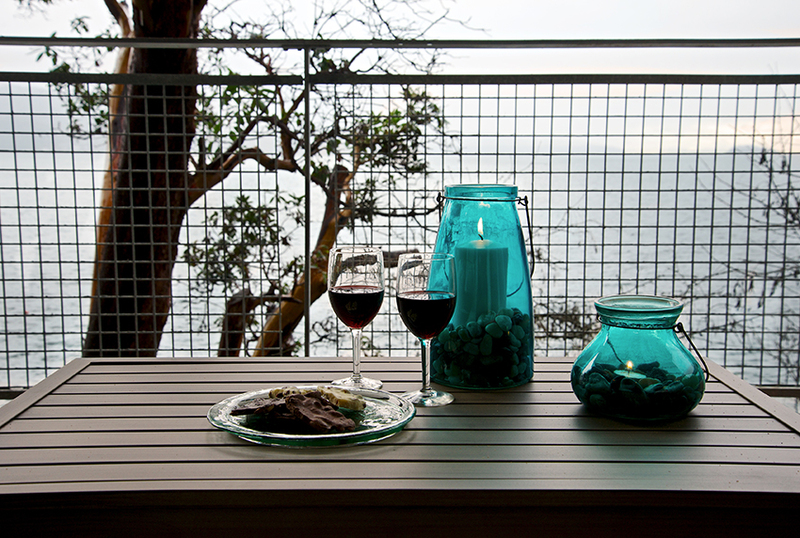 The covered deck was our hangout spot of choice - the rain fell but we stayed dry and cozy yet still got to enjoy the gorgeous ocean views and warm breeze from the outside covered deck." Follow the Bowen Island Weather Forecast to see if YOU are lucky enough to experience a winter storm. The Lazy Bowen Hideaway and Lazy B Waterfront Suite are poised on the perfect viewing cliff to watch the storms come straight at the property. Whether the rain is tapping a tune on the roof or the wind-driven waves are crashing on the beach below, the rhythmic harmony will lull you into another world of ahhhh-ness. 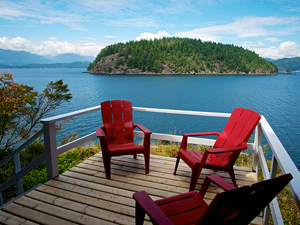 Wrap up in a throw, grab a cup of hot Joe and immerse yourself in the fresh air, crashing waves, and nature all around. Bet you can't do this in the city!!! 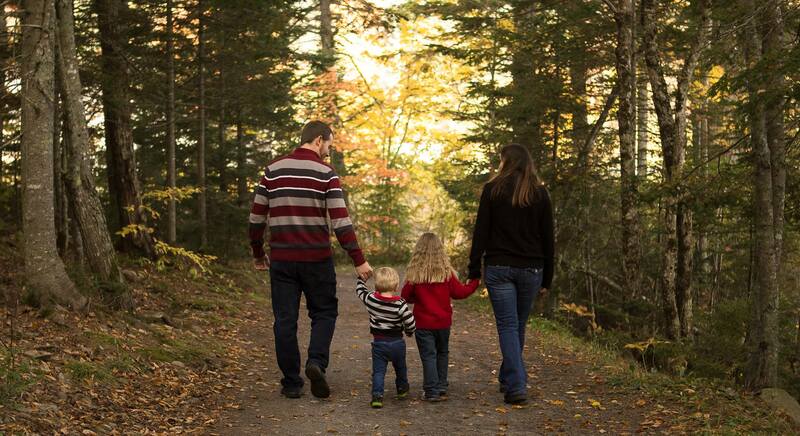 Watch the salmon, walk the trails.... Fall is a magical time in the woods and by the water here on Bowen. 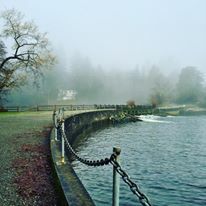 Walking under an umbrella through Crippen Park, the Meadows, and Killarny Lake, and cutting over to a cafe in Snug Cove or Artisan Square afterwards for hot drinks is a fall luxury. Find a map at http://www.metrovancouver.org/services/parks/ParksPublications/CrippenParkMap.pdf . November & December is prime salmon-watching season at the fish ladder at Terminal Creek. You can find more information and salmon-relevant maps at http://www.bowenhatchery.org, as well as in the fascinating video below, created by local, Bob Turner. Are salmon too small-fry for you? Try your luck....hike up to Dorman Point where locals have spotted a magnificent humpback whale this season. In all cases, keep your eyes open for the Orcas that swim laps around Bowen. Relax....do nothing..... but watch the ships go by..........The Lazy Bowen Hideaway and the Lazy B Waterfront Suite have front row viewing for cruise ships, freighters, tug boats and many more. Go to ShipFinder and you can now learn all kinds of information about that ship sailing by: the name, the size, who owns it, how many passengers and more. Be in the know and impress your friends........ just for the fun of it!!! 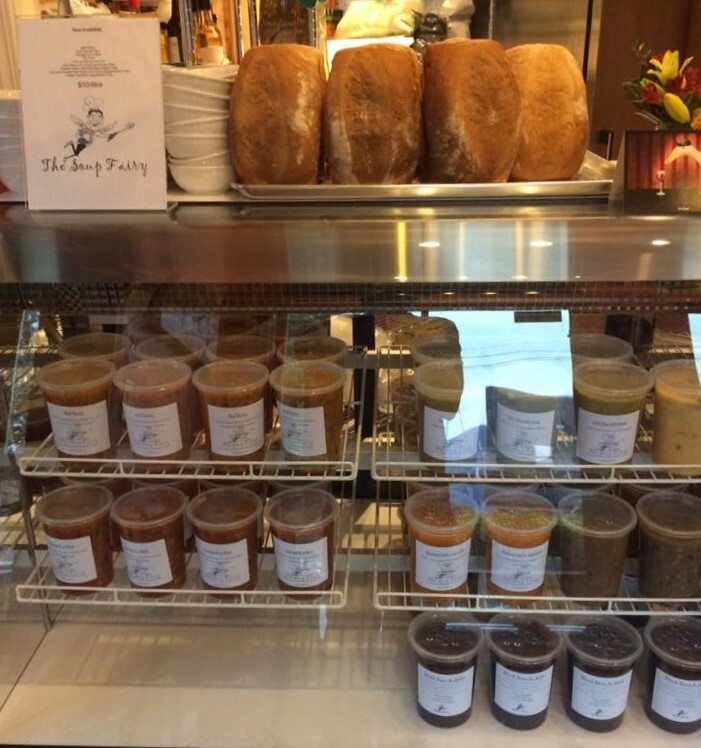 Delicious soups to take home and enjoy, selling out of the Village Baker Cafe (992 Dorman Road, Bowen Island, BC, V0N 1G1, 604-947 2869). Some examples of soups they've had on offer are Beef Barley, Sausage & 9 Bean, Dill Pickle, Curry Carrot Coconut (Vegan/Gluten Free), and Pork and Shrimp Won Ton -- and many more. Grab some fresh crusty bread from the bakery and maybe some desserts to go, and you have yourself the perfect soul-soothing meal on a cold day.